I distinctly remember one December in college when my dad took me to his office Christmas party at a dinner theatre. I hardly remember the show, but I do remember the buffet which seemed to extend into eternity with overcooked vegetables. Among the saddest victims were Brussels sprouts and beets. What is it about these beautiful, delicious veggies that makes people use and abuse them? They are delicious. They are rich with nutrients. They deserve another chance. Friends, we must raise awareness. I love roasting beets (I share my favorite way to eat them in our downloadable cookbook). But for a quicker version that makes for a crispy, salty snack, these chips are where it’s at. 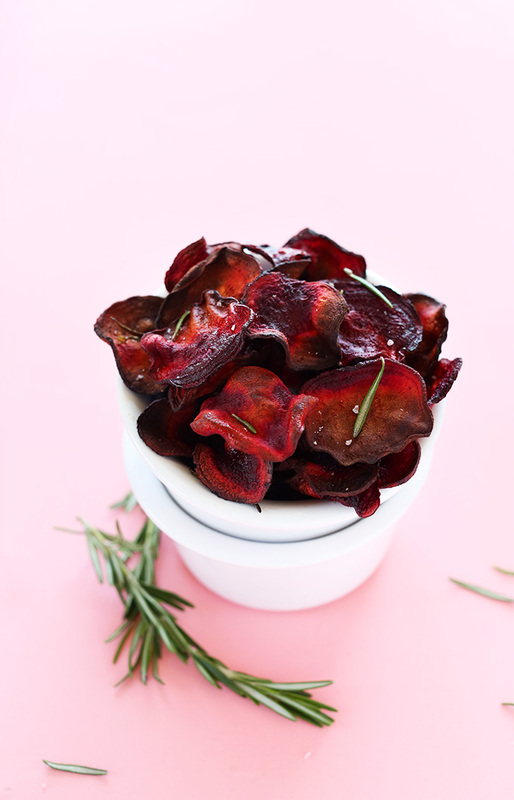 These beet chips are about as simple as it gets: 30 minutes, 4 ingredients, 1 pan. The only other tool you’ll need is a sharp knife or a mandolin for slicing. At the recommendation of my pal Kate, I recently invested in this mandolin. I’m usually incredibly hesitant to invest in equipment we don’t need in order to keep a clutter free kitchen. But when I recognize I’m missing a tool that could help complete tasks in the kitchen more efficiently, I’m all for it. If you like making veggie chips, veggie pasta and fries, this could be the slim-profile, affordable tool for you. Another perk of these chips? Beets are extremely healthy for you! Read all about the benefits over on our Fudgy Beet Cupcakes post (and make the cupcakes while you’re at it). Flavor wise, these chips lack that “dirty” earthy taste some people despise about beets (i.e. my husband). And the simple addition of rosemary adds an earthy aroma I adore. Healthy? Flavorful? Fast? Count me in. I nearly gobbled these up in one sitting – couldn’t resist! Even if you aren’t a huge beet fan, give these a try. I think you’d be surprised how neutral in flavor, yet delightfully crispy they are. Enjoy! 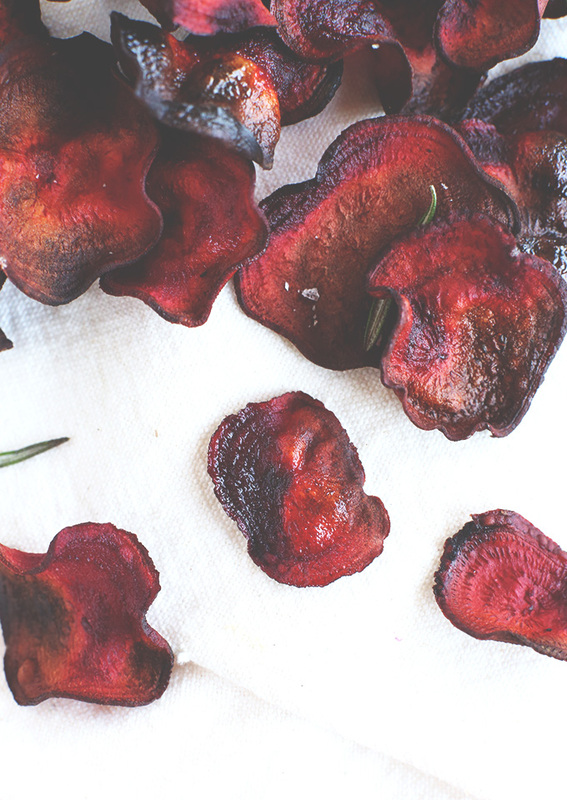 30-minute baked beet chips infused with rosemary and speckled with sea salt. Perfectly crispy, simple to make, and a healthy snack on the go. Preheat oven to 375 degrees F (190 C) and place oven rack in the center of the oven. Thinly slice beets with a mandolin (or a sharp knife), getting them as consistently thin as possible. They should curl a little when cut. This will ensure even baking and crispiness. Divide between two baking sheets and spray or very lightly drizzle with olive oil. Add a pinch of salt, pepper, and the rosemary. Toss to coat. Then arrange in a single layer, making sure the slices aren’t touching. Bake for 15-20 minutes or until crispy and slightly brown. Be sure to watch closely past the 15 minute mark as they can burn quickly. Remove from oven. Let cool. Then serve. *Nutrition information is a rough estimate calculated with 1 Tbsp olive oil per 3 medium-large beets. Besides washing and scrubbing, do we need to do any peeling of the skin? Am i over thinking this? You can peel it, but we don’t find it necessary unless the beet is particularly grimy. Hope that helps! one quick question, when i tried this recipe my chips turned out soggy. any suggestions? Hi Sasha, a few ideas: 1) try cutting the slices more thinly, 2) cook at a slightly higher temperature, or 3) cook longer. We hope that helps! See comments above for tips! Rona brought home some of these from Whole Foods sand we loved them so I found your recipe and bought three beets. First beet: Sliced very carefully with a knife, but none of them curled. Couldn’t spray with oil, so I poured a little over one line of beets in the tray and rubbed the others on it. Just to be sure I oiled both sides. Then I set the oven 250 and after 10 minutes checked carefully to make sure they were’nt burning. Nearly an hour and at least five more unsuccessful checks later (had time to wash and cut the stalks and greens and fry them up with onions and garlic (and rosemary, great idea) – this was the best part of the experminent) the chips finally moved from soggy to chewy. They tasted good except for the texture. Second beet. Used a mandolin, actually got six or seven of them to curl. Upped the temperature to 310. this time I was lighter on the oil and turned them over every 10 minutes. After a half hour I moved them to the large frying pan where I done the greens. Experimented with various heat settings. Found that they’ll burn quickly if you set it to high. Third beet. Combination of mandolin and knife. Set the slices on a drying rack. Left them overnight. Re-read your recipe – AND THE COMMENTS. ALWAYS READ THE COMMENTS FIRST. Rona says our processor won’t slice that thin. Peeler next time. ROFL, as I hope you are, about my misreading of time and temperature. I just made these but they come out so soggy and not crispy at all :( why do you think? Hi Sara! Sorry about that. Did you use a mandolin to get the beets uniformly thin? Mushrooms and Beets are two vegetables that are very good for you but ones that i never liked. I learned to make an amazing veggie burger using mostly those two (plus other) veggies and the beets and mushrooms not only taste great in these patties but you’d be hard-pressed to tell that it is a veggie burger and not a rare beef burger looking at it, and the taste is awesome. Recently I discovered the beet chips, and I adore these even though, as I said, I never liked beets. 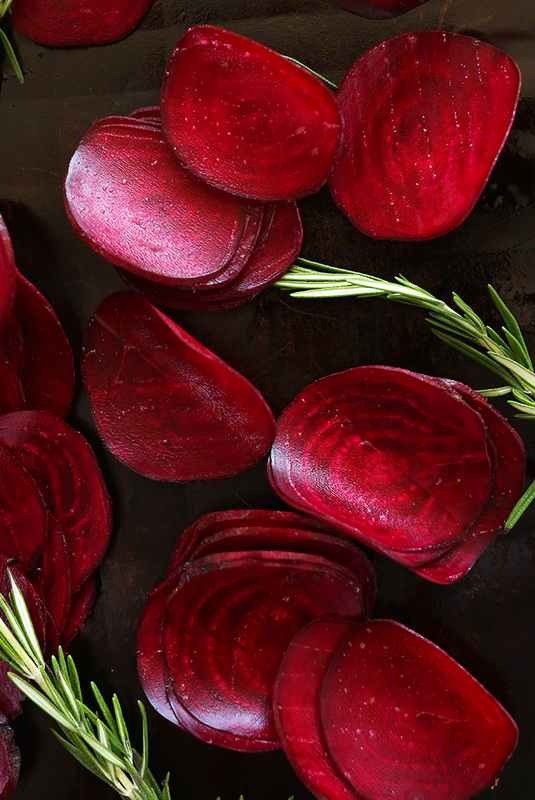 I’m experimenting with both pre-cooked and raw beets and will try them using a dehydrator, oven and air fryer and will report back once I see which works best…..wish me luck, because these can save a bundle over the cost of buying them in the stores or online! Hi Dana! Can’t wait to try these! Question tho, do you cook the beets before slicing them up?? Nope! Slice prior to baking. Also having a lot of trouble getting these correct. Simply not as easy as recipe suggests. Have read many recipes on baked beet chips, reviews, and tried it many times. I think the solution must be just the right thickness (what setting on mandolin is correct?) the type (canola, olive or coconut?) and amount of oil (and method- spray, or toss?) , the type of bake setting (convention, convection or hybrid? ), and the bake time. Even the photo from this recipe shows parts of the chips are burned- how are these made commercially? Totally disappointed I this recipe. We made a triple batch for Christmas, as and they were all soft and never crisped up. No matter how long we cooked them, then they started to burn. Couldn’t find a happy medium on them. Had to throw them all away. I struggled making this with some beets burning while others being soggy, and sticking to the baking tray. I think it’s largely a matter of getting an even, but not overwhelming layering of oil over the beets. I found it helpful to to spritz them with oil from a sprayer and turn them over while already on the baking sheet. Also patted them to get rid of excess moisture. Lastly, a silicone baking mat also helped stop them from sticking and burning and made for a quick clean up. Anyway, just my suggestions for helping to make this recipe a little more dummy proof :-). Overall very good, I love these chips! This is fantastic! My kids loved it… although I ate most of them before they got their hands on them. Simple snack! Wonderful combination of flavors, excellent idea for a baked beet recipe. I WANT TO KNOW MORE ABOUT IT. I dont know why but, healthyhappylife delete the oldest recipes, for me, its not a very good option. Oh my word! When the beets are roasted, the natural sugar caramelized and they are so wonderful! ? Do you have any tips on making these chips along with sweet potato ones in my new Exacibur Dehydrator? What other sorts of things can I dehydrate? What temperatures do they require and for how long? 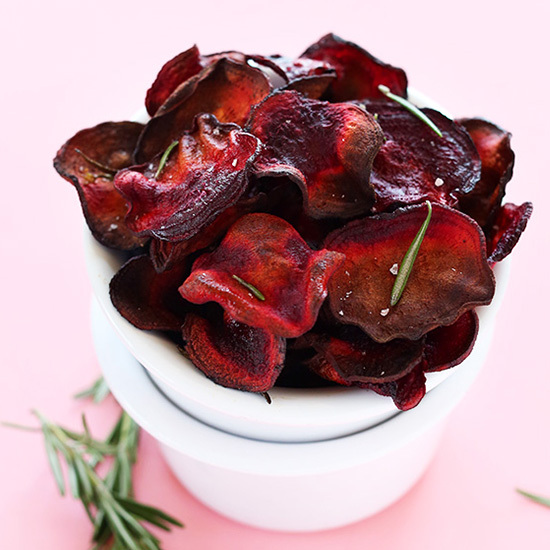 Another website with a recipe for baking beet chips says the secret to crispy chips is to first mix the chips with salt and oil and wait about 25 min for the beets to rid themselves of extra water. Then you add them to the baking tray to cook. They didn’t add rosemary but I think rosemary would be very tasty. I have not made beet chips yet but plan to since Dr. Oz highly recommends them for liver health. Hopefully, this baking method will alleviate the problems that folks are having with rubbery or burning chips. Definitely going to try this. Love beets!! Made a batch Thursday and had left them I need a zipper bag on the counter. My friend came in, saw the bag of chips, and before I realized it, she had almost finished half a gallon zipper bag of beet chips! They are that good! Well, today I made two batches again. My beets were very large so the chips look really nice. My chips were crispy right after being baked. I put them in the Ziploc bags, but they turned rubbery fairly quickly only after a few days. How to prevent them become rubbery. Thanks. I have tried to make beet chips for ages and have followed different instructions, however, they always come out soft. When I cook them more, of course they burn. Help! Any suggestions? What am I doing wrong! This is the closest recipe that made them halfway crunchy. Hi! Have you used a mandolin to cut them? Yes I use mandolin. This is the fifth time I’ve made them and I ended up throwing them out. I’ve tried different temperatures, too. 350, 375 and 400. Cooking times from 20 -45 minutes. This last batch burned but never crisped. No, they start raw! Just raw sliced beets baked until crispy. Just made these with golden beets which are so plentiful now – super yummy! Thanks so much! Do you make a red mess when slicing the beets? These were so easy to make and yummy. I used golden beets and basilet. I don’t have a mandolin so used the knife method. I had to bake some longer but I was fine with that. Could you dehydrate these lovely chips and store in vac sealed jar? Ooh I am excited to try these out! I think they will be the perfect healthy roadtrip snack that I was looking for! I’m very excited to try this recipe. I would like to add that canola oil as well as all vegetables oils are extremely unhealthy. Also, olive oil has a low smoke point and should not be used for cooking, roasting, etc. Coconut oil is a great and healthy alternative. Just wondering if you use already roasted beets. Or if I start with raw beets? 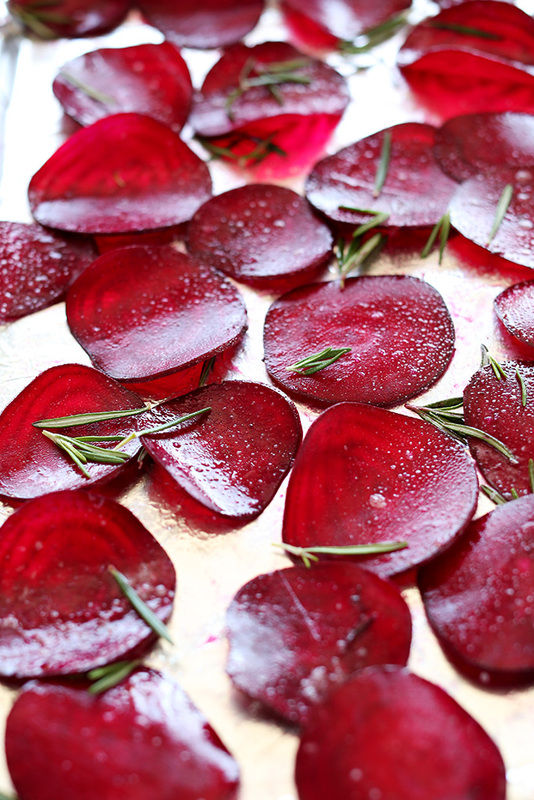 sweetie- you use raw beets and you yourself roast them in your oven… isn’t that wonderful? Have eaten beets for years but we always peeled them before eating/canning/whatever – is that not a necessity with these? Or do the rather tough skins not bother when baked? These look great, can’t wait to try them! Thanks! slice them thinner on an electric slicing machine if you don’t have the mandoline manual slicer – and lower the temperature, turn them after 5 min and monitor carefully!! 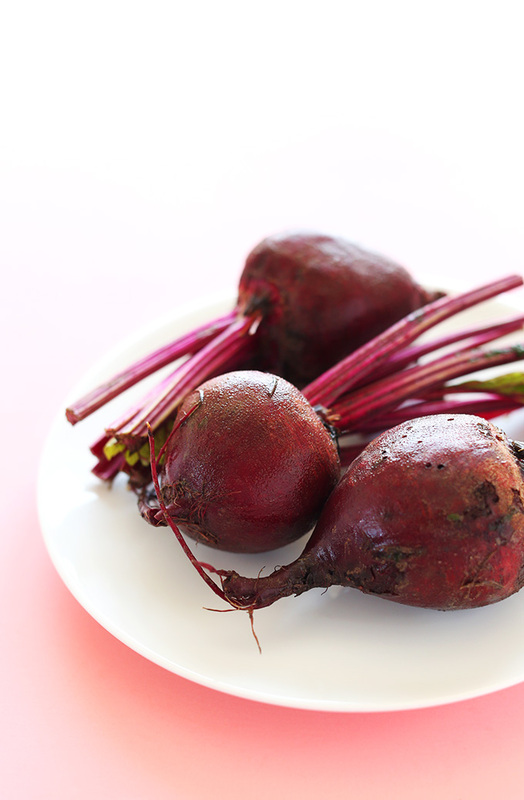 Do you need to take the skin off the beet root first? I’d peel them completely first before roasting – the skin is tougher and makes the slice curl. I was bummed…I had such high hopes for these. They were either soft or burnt, no in between. And instead of the sweet/salty balance, I feel like I mainly just got the earthy “dirt” taste. Next time I’ll try frying to see how that goes. what went wrong?? A small portion turned out, after I kept them baking longer. The ones that made it tasted delish & perfectly crispy. The majority however stuck to the cookie sheet or stayed slightly soft. I cut super thin with slicing blade in my food processor . Would parchment paper or greasing pan help this?? Hmm, yes try greasing the pan next time! Perhaps the oil didn’t get dispersed evenly on the ones that stuck! Hi. I love the storebrand beers chips but they are quite pricey. I tried your recipe but I can’t get the to be crispy. They are just not chips. Help. What am I doing wrong? Hmm, did you use a mandolin cutter? I too had disappointing results. After 10 minutes totally burnt or burnt on the edges and soggy in the middle. Love beets, love rosemary, and definitely love the Benriner Mandoline, so this is a done deal – thanks! I love beetroot chips but I never tried making them myself, especially not with rosemary. It just sounds too good to be true! But this recipe will definately be tried the next days. Thanks for sharing! I tried this recipe but I used golden beets and it was delicious. Sliced with mandoline, in oven short time, but burned beyond recognition. Will try again, less time. I love beets and look forward to making this. The beet recipe looks great! And rosemary is one of my favourite herbs. Can these chips be made ahead of time. How many days will they stay crisp. I can’t rate it as I have not made it yet. I remain hopeful. I had disappointing results. The chips were burnt before they got crisp. I did slice them paper thin on my mandolin. I cooked them at prescribed temperature. I cooked sweet potato chips that came out great. Cannot wait to try these, I love veggie crisps and these looks delicious! Sliced almost paper thing with the mandolin. Cooking for 22 minutes so far and still wet. omg i LOVE beets! i don’t understand how you can’t, but to each their own! :) this recipe looks wonderful and i can’t wait to try it. thanks dana! I love this! Roasted beets are one of my FAV. vegetables of all time! 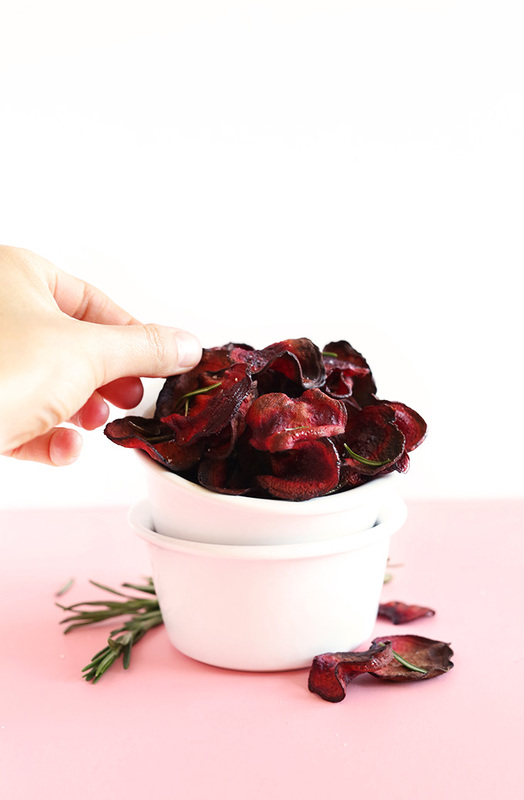 I love the idea of a beet chip that isn’t drenched in oil! These loook sooo yummay! What a great snack!!! Looks beautiful and delicious! As if beets couldn’t get any more beautiful! I really love the photography. Loving beet chips is really a moot point. I just had beets in my CSA and didn’t know what to do with them, now that I have this recipe, I hope I get a bunch in my next batch! making beetroot chips has been on my to do list for a while..you have definitely inspired me to recreate my own batch. these look delicious and i can imagine how good they taste with all that rosemary and salt! I know what I’ll be doing the next time I acquire beets… making these. And then eating them all. This has blown my mind – I love beet chips and now I know they can be baked there will be no stopping me… except my oven has broken and the replacement not delivered until next week… CRY! Oh yum, I think I’m gonna give these a go today! Every time, I visit I fall more and more love with your work! Beautiful and delicious as always. Mine didn’t last that long! I ate them all up. But I think once they’re completely cooled you could keep them stored loosely in an airtight bag or jar for at least a couple days if not more. Hope that helps! So funny! I finally ate the beet chips I bought at Sprouts yesterday & just last night I thought – “I need to learn how to make these”. Thanks for answering my thought so quickly!! HA! Ha! What are the odds? Hope you enjoy these auntie! This sound amazing. I love my mandoline — it’s great for slicing veggies for stir fry. These are absolutely gorgeous. Beets are so wonderful! I love them paired with rosemary too! Thanks for the great idea for my kids luck box! I was at a fancy restaurant the other day and they had something similar on the menu, I had never seen it before and really wanted to try it so I’m so glad you posted this recipe! Love the colour of those beets, too! Thanks katy! I’ve never been at a restaurant with beet chips, but I want to now! Oh I just want to leave work right now and make these. I love beets (and Brussels sprouts). Why people have an aversion to them I’ll never quite know. Probably because they Haney tried them cooked properly. Thank you for the recipe I’ll be enjoying these beet chips on my hike this weekend. Thanks for sharing! Amazing! Beet chips are my favorite of all vegetable chips! Will have to try this myself! I love veggie chips and these look marvellous! I love beets and my veg patch is bursting with them at the moment! Perfect recipe, thank you. Yay! Hope you love these, Elyse! Jealous of your garden! Brilliant! I love beets. No Dwight references, please. If John were here, he totally would. i like the idea of making beet chips but the only struggle is to get them so thin. A mandolin really is the secret here. But I don’t think it’s impossible with a very sharp knife and a steady hand. If you have a food processor with a slicing blade, those work beautifully! Also, I believe that is the fastest method. May need to try both just to compare methods! I have a food processor and it seemed to slice them thin enough but my beets baked up kind of soggy. Use a potato peeler, cutting away from the hand. Slowly, carefully. It’s worth the extra time and patience. The are beautiful! The beers chips are always my fave when I get those veggie chip mixes. I’d love to try these with all different colored beets- red, yellow, and those gorgeous striped ones! Maybe I could even get my hubs to eat beets this way! Those mixes are my fave! I think mine came with carrots, beets and green beans. So good! Oh, man. I am definitely making some of these when I get home! I agree about veggies. They should be given time and attention (not just overcooked to mush). It makes me sad when I hear “I don’t like vegetables” because it is an entire class of foods. And, now I will stop talking about vegetables before going overboard. Also, on another note I like the pink backdrop. I have been eyeing pink poster board every time I go to the store but had no idea how to use it. I did get blue and now am wanting a session with it and blueberries after seeing this beautiful ruby red on pink. Don’t know what recipe yet… but it most have blueberries. Sounds fun! I love experimenting with colorful backgrounds. Good luck! Beet chips are one of my favorites to munch on! Do you think I could make sweet potato chips along with them using the same recipe? Yes! See my potato chip recipe here. I adore beet chips. In my experience, a mandolin is a necessity. I usually keep it simple with salt+pepper, but love your addition of rosemary! Agreed! Glad you love beet chips as well, Maryea!